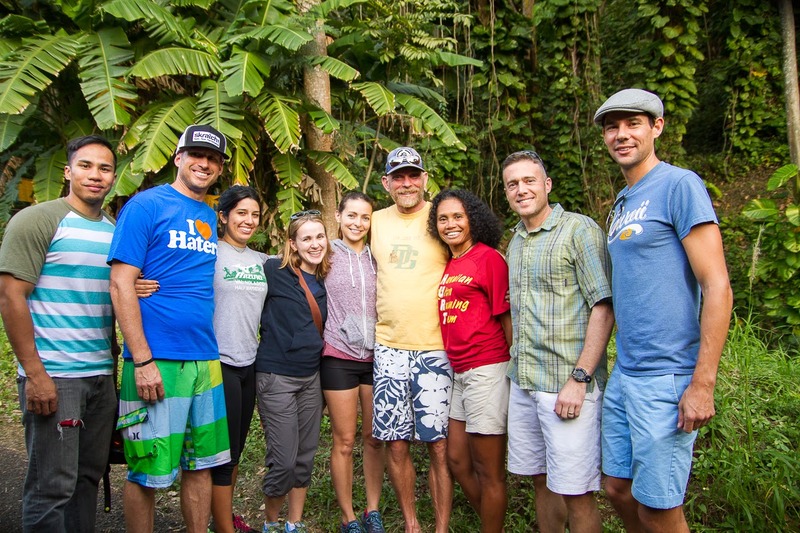 This year I had the privilege of spending time supporting the HURT 100 here on Oahu. Last summer I entered the lottery to race it, but (luckily) I did not get selected to run the 2015 edition. I say "luckily", because it allowed me to experience the race as a volunteer, pacer, and spectator. It was truly an incredible experience to be involved with the race on so many different levels. I now have a better understanding why people are so passionate about one of the most incredibly challenging ultra marathons in the world. There are some great blog posts and post-race interviews from the brave souls that toed the line this year, so I won't go into great detail about the course, the welcoming aloha spirit or the deep sense of "ohana" that so many of the runners/pacers/volunteers/spectators experienced. Links to several of this year's race reports and video interviews are at the bottom of this post. 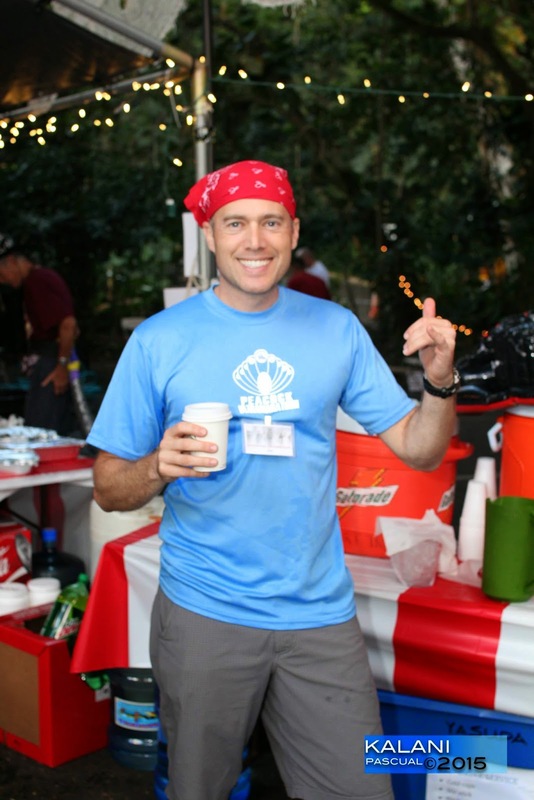 I had the pleasure of volunteering at the Pirates of Paradise aid station, also known as the Manoa aid station. 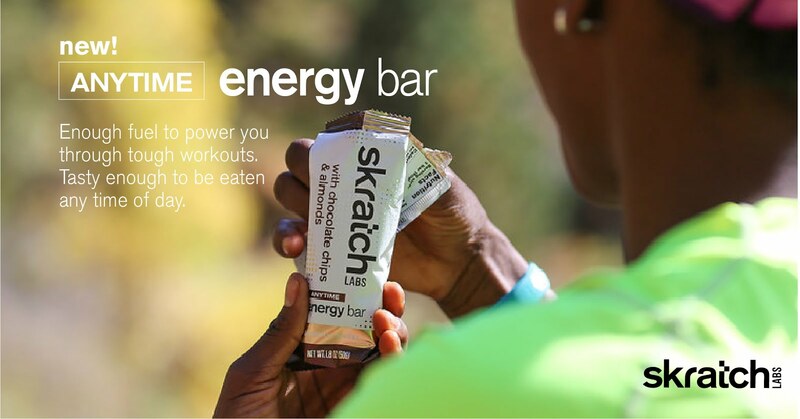 This is the first, fourth, seventh, tenth, and thirteenth aid station on the 5-lap course. I don't know if it's the "best" aid station on the HURT course, but it was definitely one of the best decorated ones, with its Pirate theme. Excited about helping my fellow ultra runners, I arrived around 4:55am on Saturday (I think there was one other eager volunteer who arrived before me). I helped set up the aid station and was put in charge of the drinks. Naturally, they put the Navy guy in charge of the grog! My shift ended around noon and I headed home to get some rest before I headed back out to pace my runner. I truly enjoyed my time helping out at the aid station and making some new friends in the process! Marian and Neal Yasuda, the Paradise aid station Captains, were phenomenal in their care of not only the runners, but the many volunteers who came out to support the race. Last July, me and my training partners Jeff Snyder and Michael Garrison all entered the HURT Lottery, but only Michael got in this year. It was truly a mixed blessing, as the thought of running the HURT 100 as my first 100 miler gives me some serious anxiety. After the lottery party Jeff and I were breathing sighs of relief, as we knew we would get to experience HURT as pacers and give ourselves an extra year to prepare mentally and physically before attempting the race ourselves (keeping our fingers for lots of kukui nuts this at this years lottery!). As local runners, we are lucky to get to train on the HURT course in every condition imaginable and at any time of day or night. The three of us did a HURT loop about 3 weeks prior to the race to help us figure out how best to support Michael during his second attempt at finishing HURT. I had been coming back from a hamstring injury in November, so the training run was also a test for me to ensure that I was physically able to fulfill my pacing duties. Fortunately, my hamstring didn't mind the slow pace that the HURT course imposes! L-R: Jeff, Michael, and Joe. Prepping Michael for his 3rd loop. Based on Michael's goal of running HURT in 35 hours, we decided that I would start pacing him on lap 3 (mile 40) from the Nature Center and hand him off to Jeff after about 27 miles (lap 3 and a third of lap 4 - mile 67). We were expecting Michael to come into the Nature Center between 5 and 6pm, but he ended up arriving a little before 7pm. 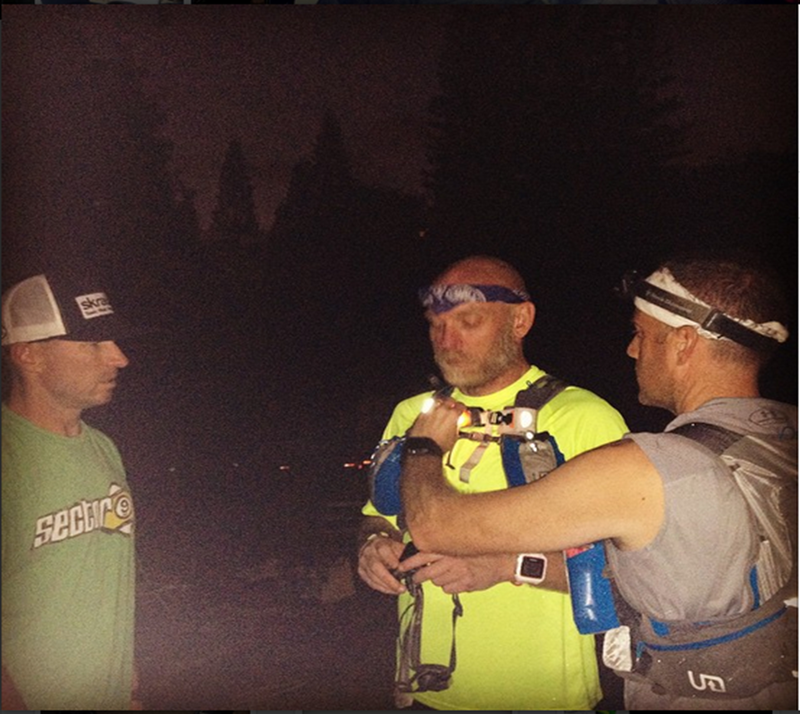 During Michael's last two attempts at 100 miles (HURT 2014 and Javelina 2014) he was forced to drop out due to severe stomach issues. When he got into the Nature center he informed us that his stomach issues (violent dry heaving) had slowed him down over during the latter parts of lap 2. With his later than expected arrival, we knew we would be bumping up against the cut-off times for the rest of the race. As someone who has dealt with nausea during an ultra, I could sympathize with Michael's situation. But I'm also fairly up-to-date on the latest research regarding hydration during endurance events, so I thought that we could overcome the stomach issues going into the evening hours. I knew the temperatures would drop a little over night and that we may be able to "reset" the stomach since he wouldn't need to drink as much as required earlier in the day. The key was to be able to do it while still keeping him moving and still taking in enough calories. After about an hour and a half into lap 3, Michael's stomach seemed to calm down. This was a good thing, but it probably came at the expense of him not eating enough. We got some potato soup into him at the PP AS and that seemed to sit well with him. His legs seemed to be working fine, but I could tell he was pretty spent from the last 6+ hours of stomach cramping and dry heaving. We made our way up out of Manoa and on down into Nuuanu. We made a good effort to get in and out of Nuuanu quickly and were back on our way up the hill and back down to the Nature Center. Overall, Michael ran a great 3rd lap considering the difficulties he had earlier in that afternoon and evening. We came into the Nature Center around 2:30am (20h30min into the race). I pushed Michael pretty hard down from the pig gate at the top of the Manoa Cliff trail back to the Nature Center. I knew he would need every second if he was going to make the 36-hour time limit. We made good time, but that last push really took its toll on his energy levels. The next leg from the Nature Center to Paradise was a slog for Michael. While his stomach seemed fine, his energy levels were super low and this affected the pace. When we got into Paradise for the pacer swap with Jeff, Michael was still in a low spot. Pauline (Michael's wife and crew chief), gave him a pep talk and pieced him back together and turned him over to Jeff to chase the cut-offs. Jeff and Michael made an incredible effort on the rest of the 4th lap and two-thirds of the 5th lap, but he just barely missed the cut-off at Nuuanu Aid Station. We are all very proud of how hard Michael worked to try and finish this incredibly difficult race. I was very fortunate to be part of his team and I would pace/crew again in a heartbeat if given the opportunity!